Updated 11-14-2018 To work with the 1.47.49 (November 13, 2018) game patch. The Sim's thought bubble in the screenshot best describes my initial thoughts when I noticed the screen distortion of TVs that began occuring with the January 7, 2016 game patch. I couldn't figure out what was going wrong with my game. Tried a game repair, but that didn't help. Finally last night I searched for a solution as surely this was happening to someone else? Quickly I found that it's happening to everyone else. Lots of folks are crying for a game option to turn that junk off, but apparantly EA thinks that if the game is sped up the video should look like a low quality VCR from the '80s. Seems to me that if the TV looks like that sped up (which mine doesn't) then so should the Sims, right? Or even better, let's just go back to the old way. The effect is easily turned off in the XML, but that requires a separate patch to every TV object and makes it so that any other TV mods would conflict with a mod to turn off that effect. So my answer was, of course, turn to the Python script. This script just overrides the Python that sets up that effect to always turn it off - for every TV in every game pack, modded TVs, even new TVs that haven't been made yet. The mod name says it all. Well, almost all. A Simmer pointed out that there was also a static noise that was replacing the audio for the video. I run with sound off or my own music playing over the game typically so I hadn't noticed. So now two new flavors of the mod are available. One just turns off the static effect, and the other removes the "mute" feature entirely from video clips so the sound for them will play normally. This is a script mod, so extract the TS4SCRIPT file contained in the download file into your mods folder. It can also be placed in a subfolder, but no more than ONE subfolder deep. Once installed, it will automatically turn off the video distortion with no user-intervention required. This mod is written to work with the version 1.47.49 (November 13, 2018) game patch; however, it should work with newer game patches. Due to the way the mod is coded, it should be very stable with future changes to the video scripting unless major changes are made to the VideoComponent of the game. This may be the simplest mod I've made, took all of maybe 10 or 15 minutes to write - it literally took me far more time to make the screenshot and write this description. So if you're looking for mods to take apart to learn about writing mods, don't start here - but the source is included as I always do. EA, of course, for continuing to provide me with the "WTF?" moments that inspire my mods. Oh, and Scripthoge as usual for the script injection method used. Use only one flavor of the mod - if you change which version of the mod you use, be sure to remove the old one! 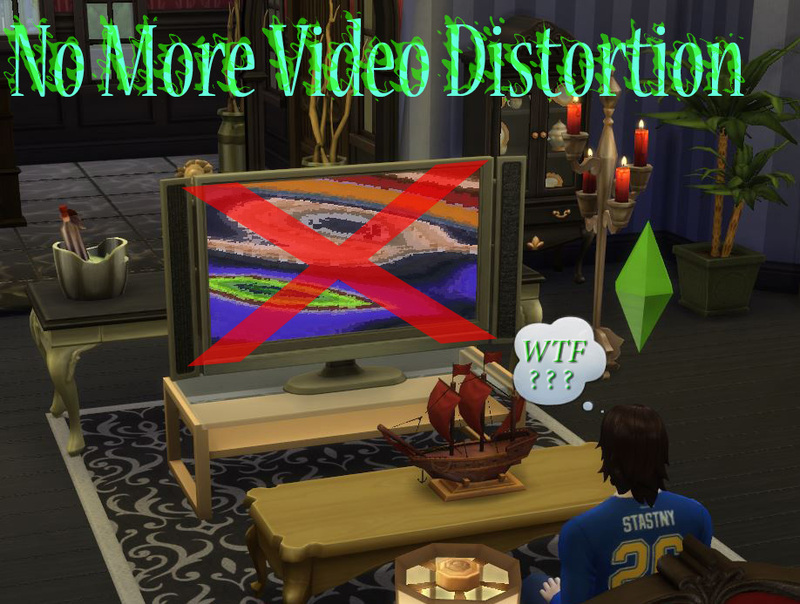 NoVideoDistortion.zip | Description: Remove video distortion from objects when speed 2 or higher is selected.